In den letzten 4 Jahren hat es viele Selbstmorde, die im Zusammenhang mit der Katastrophe stehen, gegeben. Die meisten Betroffenen stammten aus Fukushima. The number of nuclear evacuees dying from deteriorating health caused by refugee life is still growing even though four years have passed since the unprecedented calamity that struck on March 11, 2011. As of March 4, the deaths of 1,867 people in Fukushima Prefecture had been recognized as related to the earthquake, tsunami and nuclear crisis, surpassing the 1,603 who are deemed to have been killed there directly by the quake and tsunami. Nearly 120,000 people in the prefecture are still living as evacuees, stuck in stressful environments. Among the three prefectures hit hardest— Fukushima, Iwate and Miyagi — Fukushima has a particularly high “disaster-related death” ratio of 54 percent compared with “direct deaths.” By municipality, Minamisoma led with 469 related deaths, followed by Namie at 342, Tomioka at 291, and Iwaki at 130. In Iwate and Miyagi, by contrast, the ratio of disaster-related deaths is only around 9 percent for each. Iwate had 450 related deaths versus 4,672 direct deaths, while Miyagi had 909 and 9,621, respectively. Many suicides have been reported in Fukushima amid the growing despair caused by the prolonged evacuation. A death is recognized as disaster-related if it is deemed by a panel of doctors, lawyers and other experts to have a causal relationship with the quake, tsunami or nuclear disaster. For each such death, ¥5 million in condolence money is paid to the family’s main breadwinner, and ¥2.5 million to others. But objections from relatives of dead people who are not recognized as disaster victims by the panel are rising as the evacuation drags on. 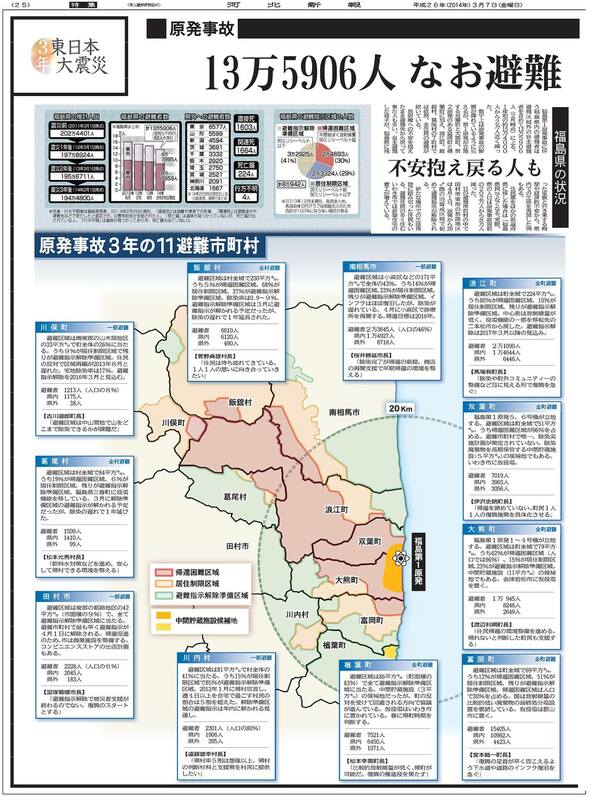 According to Fukushima Minpo’s tally of data from 24 municipalities, there have been at least 46 objections, including 19 in Iwaki and 13 in Minamisoma. Lawyers say the kin of those not recognized are frustrated because there are no clear standards for determining who should be recognized as having died from disaster-related causes. They fear that the number of objections filed will increase as it will be even more difficult to prove a causal relationship between a death and a disaster as time passes. Some are calling for setting up a mechanism to pay out condolence money specifically for deaths related to stress caused by the nuclear disaster. Meanwhile, municipalities hosting large numbers of evacuees are improving efforts to visit residents in temporary housing to check on their health. As of the end of January, about 14,600 people from the town of Namie were still living in temporary housing in the prefecture, while some 6,400 others were living as evacuees elsewhere. Twenty-five counselors from the Namie municipal welfare office are making routine visits to such housing units to check on people living alone so solitary deaths can be prevented. The town has also placed 30 staff in 10 prefectures around the country, including Kyoto and Fukuoka, to provide support for residents who fled Fukushima. The staff visit the homes of such people individually and listen to them to ease the loneliness of living far away from home. They also hold gatherings for the evacuees so they can socialize and talk with one another. In Chiba Prefecture, such efforts have led to residents themselves holding tea parties for displaced people in the neighborhood. “It’s difficult to look after people scattered around in such a vast area, but we want to continue providing support for each and every one of them,” said one of the Namie welfare office staff. In Minamisoma, prefectural officials and the municipal welfare office staff work as a team on home visits. Prefectural officials make the rounds of temporary housing units on weekdays, while the welfare office staffers pay daily visits to both temporary and rented units, as well as to permanent public housing units for evacuees. The city and Minamisoma police have also set up a “three-day rule” under which welfare staff report to the city and police if no physical meeting is reported for three days from residents of the homes they visit. The rule was established after a number of elderly living alone were found dead last spring, sometimes days or weeks after the fact. While some initially felt the frequent visits were intrusions, others began making their own rounds to check on neighbors, municipal officials said. The city and police have also established a network with newspaper and milk delivery personnel to routinely check on the elderly. In November, a milk delivery person found an elderly woman collapsed in a public housing unit, saving her life. This section, appearing every third Monday, focuses on topics and issues covered by the Fukushima Minpo, the largest newspaper in Fukushima Prefecture. The original article was published March 5.